My name is Kelly "K-Fresh" Frazier. 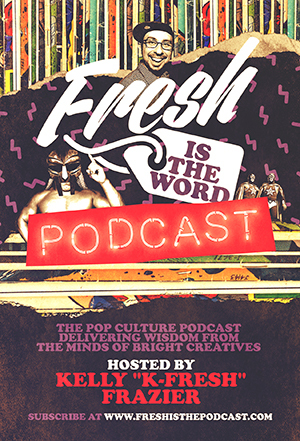 I'm based out of the Detroit area and I'm host of the podcast Fresh is the Word where I like to deliver wisdom through great stories from the minds of bright creative of pop culture. Through those stories, we like to dissect the journey of our guests and present actionable lessons and advice for our listeners no matter what career or avenue of artistry they pursue. Guests span from the world of music, comic books, wrestling, and many other forms of pop culture. Patreon is a place where fans can support the creators they care about on an ongoing basis. In exchange for your support, you'll get some cool perks and rewards in exchange. Your support helps to cover the costs of running the podcast and keep the show on air. With Patreon, you can pledge a couple bucks each month in support of the podcast. You’ll also have access to perks like shout outs, your name on the website, Twitter follow, interview audio archives, podcasting tips, and all sorts of other digital goodies. You get a big THANK YOU from me and are listed as a supporter in the Fresh is the Word web site. You’ll get access to posts regarding things I’m in the process of working on and podcasting tips. You get everything from Fresh Shout Out, plus you get access to bonus content. That could be Patreon exclusive podcast episodes (at least 2 per month) with archived audio of past interviews (from all sorts of genres of music) from articles I wrote for various publications and even unreleased and never used interviews, among other digital goodies. You get everything from Fresh Bonus, plus you get to submit questions for future guests whose names I make available on Patreon. You get everything from Fresh Questions, plus you get any sort of dialogue of your choice (within reason and not harmful) read on an episode of your choosing each month. That could be a shout out on air, a shout out to another person, or any sort of content that you have written. You get everything from Fresh Questions, plus we were record an episode of the podcast together each month where I’ll interview you and we can pretty much talk about whatever you want. It’ll be a Patreon exclusive first, then be added to the main feed. You get everything from Fresh Questions, plus, an official product mention and placement on the show on every show. (We'll connect via email for specifications and requirements.) Monthly there are 4-8 shows.